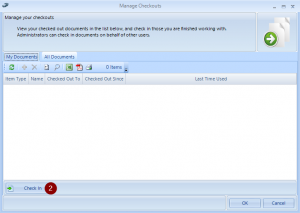 The Manage Checkouts (1) helps RM Studio Administrators and Super Users manage the documents checked out to other users. We recommend caution in using this function regularly without first checking with the individual who has checked out the document, because the unsaved data will not be saved after the document has been checked in via override. 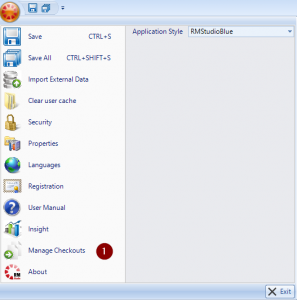 Selecting check in (2) will check in the document deleting any unsaved changes.